This example requires the "ClosedCaptionImporter.component" from Apple to be placed in /Library/QuickTime. You can download it here ClosedCaptionImporter. Please restart QuickTime Player to register SCC as QuickTime file format. The component is not needed to view the closed captions with QuickTime starting with vs. 7.1.6 or iTunes 7.4, just activate closed captioning in QuickTime Player or iTunes preferences. 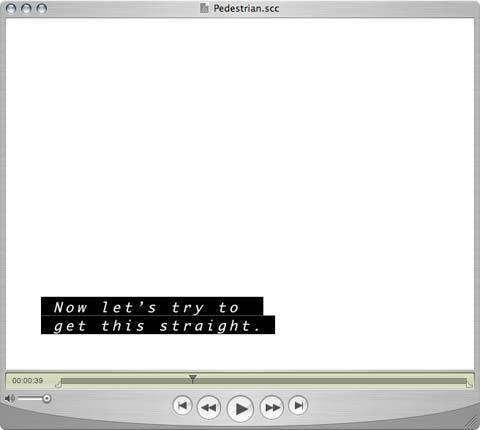 Although being there for long, SCC closed captions are still a mystery to most Mac video producers. To get pop-on captions (widely used for DVD) working, first be prepared to put aside your knowledge about subtitling, captions are different in many aspects. First there are no aesthetics like shadows, fade-ins, letter spacings and so on, some decoders even demand uppercase only. Then you will notice that pop-on captions are slow, the more text they have to show, they need more time to show up. Captions are not synchronized tracks like timed text, but loaded on demand, similar to web pages. To make it even more complicated, captions try to tell all you cannot hear. Bells, off-screen calls, noises and so on. There are techniques that are straightforward, like using italics for off-speech. Others demand sensitivity for your viewers. Covering speaking lips with captions is not a good idea, as this visual information should be aided by captions. In the ideal form captions should help associating text to speakers by placing the text near the speakers image on the screen. zeitAnker Annotation Edit helps you to get most standard captions done. Perfect captions are a very time-consuming task, so free positioning of captions on the screen is not built in for now. But your customers need captions and you can offer them with small foot print. Yes.To accommodate the needs of closed captions, too short gaps are closed, you can specify the short gap length in the export preferences. Defaults are 15 frames, minimum are 4 frames. The extended character set does not show up wit the closed caption component. Yes. Is not supported well by the apple developer example yet, but Compressor or DVD Studio Pro play nice. As Annotation Edit cannot rely on an experimental component, here are the steps to quickly create the closed caption movie with QuickTime Pro. 1. Open the scc file exported fro Annotation Edit with QuickTime Player. It will be standard definiton 640*480. 2. Open your movie. NTSC frame rate is preferred, but not essentially necessary with QuickTime Player. Compressor and DVD Studio Pro require NTSC video to work with SCC though. 3. Now set the start time of the SCC movie to the beginning, then copy your movie (640*480 in size) and add it to the SCC movie. 4. After you adjusted the track layer, closed captions will show up as expected. Now you can save your movie.